When you’re trimming your budget, you start looking at your grocery store receipts with a lot more scrutiny. And if your family is big on meat and poultry for lunch and dinner, expensive choices add up quickly. Don’t assume that your food budget is at the mercy of your butcher’s business decisions. With these six quick tips for the deli counter and your kitchen, you’ll be able to spend less, get more, and make it last longer. You’ll get the most value when you buy in bulk, and stores always have better deals on bigger cuts of meat. Larger turkeys often sell for less than fifty cents per pound, and you can frequently find large pork loins and picnic roasts for less than a dollar per pound as well. I’ve even seen lean beef for less than a buck per pound on a giant roast. Don’t be afraid to take up space in your freezer. Buy extra meat to get the best value, and make it last by freezing it until you need it. I’ve used all of these opportunities to drastically reduce the monthly cost of meat. I cut longer pork loins into boneless medallion steaks, and cut chunks from larger beef roasts for kabobs and hearty stews. When you see a good deal on turkeys, buy a few and freeze them. That way, you’ll be ready to handle family gatherings – even the surprise visits. Don’t get stuck only thinking of cooking a turkey for the holidays either. Consider using an outdoor turkey fryer or oil-free roaster to pull off a backyard summer gathering. Add potato salad and watermelon, and you’ll throw the best party on your block without spending too much. Meat doesn’t come cheap, so if it’s a big part of your family’s regular eating habits, then discount grocery coupons need to be part of your long-term saving strategy. Granted, you’ll probably only find coupons for brand-name meats, but don’t give up on how much they can help. You can often find great deals on a regular basis, particularly for canned seafood items like salmon or shrimp. Scour those weekly newspaper coupon inserts, and start searching online. Additionally, watch out for your favorite store’s weekly circular. Sometimes the best deals don’t come in coupon form – they’re just about timing. Depending on when your store gets its shipments, you can usually find some sweet savings around the middle of the week. I’ve seen boneless chicken breast discounted by as much as 50% on a Tuesday or Wednesday. If you have some extra time you can even get into extreme couponing, using both coupons and store sales to maximize savings. This is my favorite strategy for making great-tasting dinners and getting the most out of ground meat purchases. Brown the beef or chicken in a frying pan, and break the meat down into the smallest pieces you can, using a clean, upside down empty soup can. After you’ve thoroughly cooked the meat, you can store it in smaller containers to use for casseroles, calzones, and budget-friendly soup recipes. You can also use ground meat in one of my favorite make-ahead budget lunch and dinner ideas: meal muffins. Use smaller bits of meat, chopped frozen vegetables like broccoli, and some cheese to round out a savory muffin mixture to bake in advance. Use these to take in your work lunch, or pair a muffin with a brothy soup for family dinner. 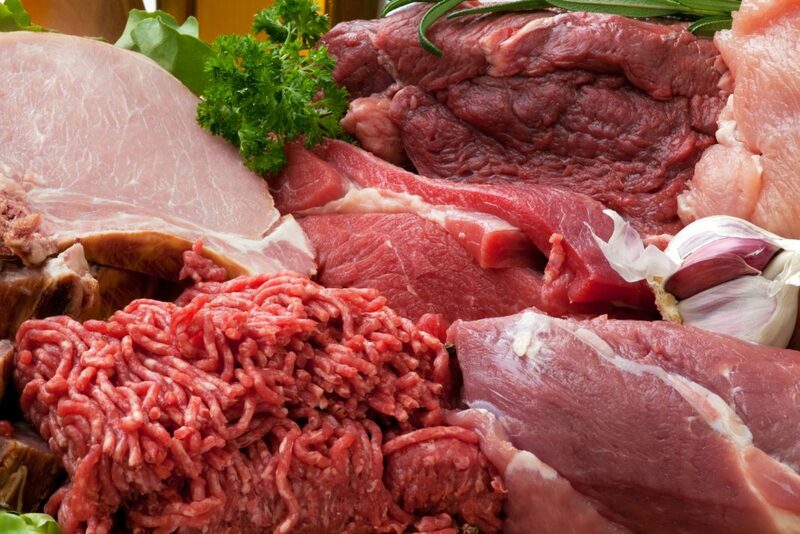 A smaller form of cubing, dicing is a great way to go, particularly if you’re starting with boneless, skinless meats. Dicing works best on pre-cooked meats like roasted chicken breast, honey-baked turkey, or smoked ham. You can easily dice up some meat whenever you have time, and then keep it on hand for a carbonara sauce or chef’s salad. This tip is perfect for you if you don’t mind putting in a little effort to save on meat costs, but you’re not exactly up for de-boning a chicken from start to finish. Expensive, pre-packaged, sliced lunch meat is one of the first things you should cut from your grocery budget category. Waiting your turn to have it sliced at the deli counter is a good step towards savings. But while you’re at it, consider asking the counter clerk to shave your meat purchases instead. You’ll get thinner cuts, which means more individual pieces per pound. With shaved meat, you’ll get a few more sandwiches without spending an extra penny. Plus, using the shaved form of sandwich meats in toasted sandwiches releases boatloads of flavor while using less product. It helps to cut calories too! So shave it up for savings, and you’ll see improvements in your lunchbox, on the scale, and at the bank. For things like meatballs, beef loaf, and hamburger patties, stretch out your meat money by mixing in up to 50% hydrated TVP (texturized vegetable protein). While you might balk at the idea of adding veggies to your meat, it’s a process that many prepared foods go through anyway. You’ve probably had plenty of foods with added TVP without knowing it. Now you can use it to make your purchases last a lot longer. Meat might be the most expensive food you put on your table. But if your family craves it, you can’t completely cut it from the menu. Instead, you need to find the ways to maximize the money you spend on your family’s favorite meats. You don’t have to spend a lot of time or sacrifice flavor or nutrition to get the best value from your meat purchases. You just need to know how to get the right deal and make the most of every meal, so you can keep meat on your shopping list without adding it to your worry list. What are some of the methods you use to save money on meat?